Want to know how long morphine remains in your body? 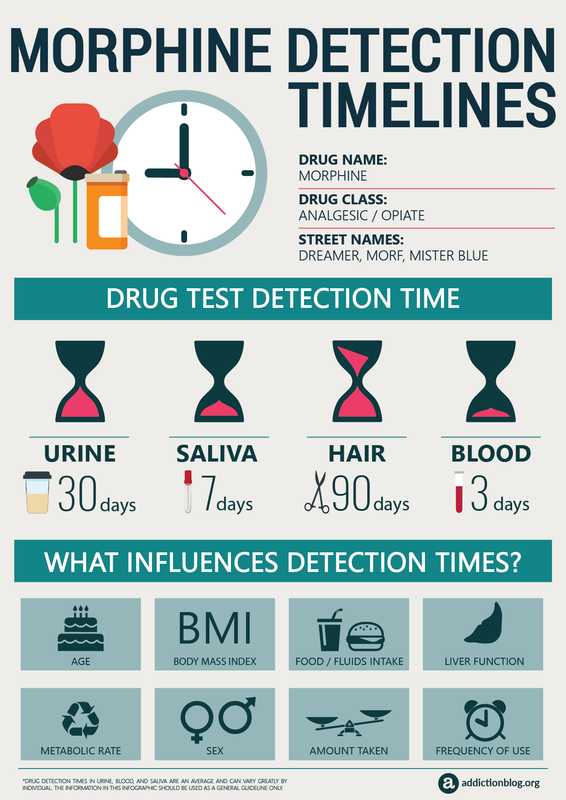 Check out this infographic to discover the exact time morphine shows up on urine, hair, saliva and blood tests. Urine: Morphine will typically show on a urine drug test within the rage of 2 – 30 days from your last dose. Hair: These type of drug tests have the longest detection periods. Expect to come out positive on a morphine hair test even after 90 days of your last use. Saliva: Morphine is detectable on oral fluid tests 2 – 7 days after quitting. Blood: These tests have the shortest detection window. If you undergo a morphine blood test, the drug can be detected from 1 – 3 days after your last use. NOTE: The information given in this infographic is for urine, hair, blood, and saliva and data are presented with average measures for morphine. This means that detection windows can vary greatly from one person to another. Use the detection information as a general guideline only. What Influences Morphine Detection Times? How much morphine you took and how frequently you used it. Single time use, or small morphine doses do not have same drug detection rates as chronic and long term use. The levels of your physical activity. People who do not engage in sports or do not have any physical activity have a high percentage of body fat compared to their total body mass. These individuals usually have a longer morphine detection time due to the increased amount of excess metabolites stored in the fat cells. The speed of your metabolic rate. If you have a slow body metabolism, than you’ll be prone to a longer detection time and morphine will leave your system slowly than in standard cases. Tolerance levels. Morphine users metabolize the drug faster once they develop tolerance to it. This will result with a shorter detection window. Urine pH. Urine pH also greatly impacts morphine detection. A highly acidic urine results with a shorter detection time. Your age. This factor plays a significant role in the speed of people’s metabolic rate. In most cases the metabolism functions decrease with age. The more time your body requires to eliminate morphine, the longer the drug will be present in the system. Your body mass. Our metabolism slow down with increased body mass. This results with longer detection time. Your overall health condition. The decrease of metabolic processes results with deterioration of your health. Furthermore, this might contribute to longer detection time. Now that you know which basic factors contribute to clearance rates of morphine, we hope to have helped prepare you for drug testing expecrations. Remember that drug detection windows are highly individual. Different people can take the same dose of morphine, in the same timeframe and one may excrete it quicker than the other. If you like to learn more about drug testing, download our free guide here. In case you are left with any questions about this morphine infographic, feel free to post them in the designated section below. We will gladly answer to all your questions regarding morphine drug detection periods. How long does morphine stay in the blood, urine, hair, or sweat?